Laura is a Grammy Award-winning singer and songwriter who started her musical career as a bass player. After almost losing her husband to a brain tumor in 2006, she wrote "Blessings" which earned her a Grammy for Best Contemporary Christian Music Song in 2012. Besides making music and writing books, Laura works at Perimeter Church in Atlanta doing music and women's ministry. Laura's family includes her husband, Martin, daughter, Josie, and twins Benjamin and Griffin. It’s bad enough to have broken dreams. But it can be devastating to realize God doesn’t always fix it. Laura Story's life was forever changed with the news that her husband had a brain tumor with incurable complications. Yes, with God all things are possible. 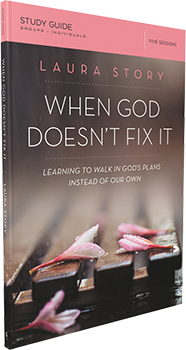 But, as with many characters in Scripture, God sometimes leaves us in crisis instead of rescuing us from crisis, to bring us closer to him and to use us in extraordinary ways.